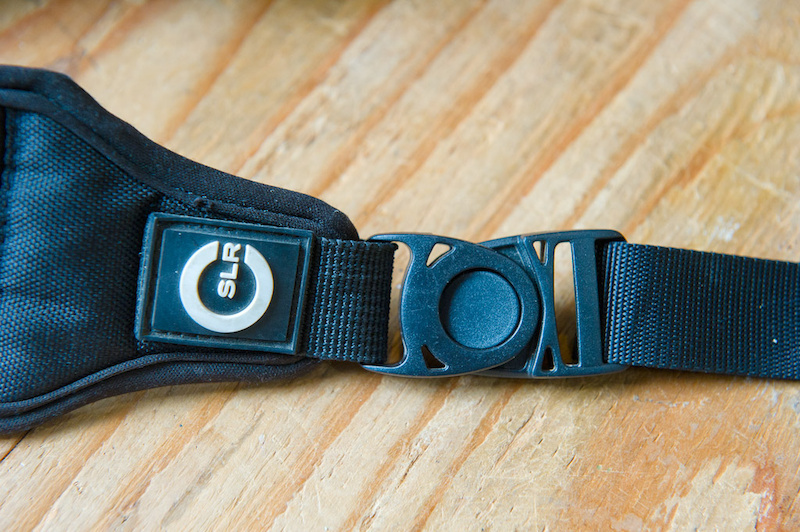 Custom SLR - The Ultimate Camera Strap? As a professional photographer used to working with heavy cameras and lenses, I am always looking for ways to make my job easier. And one of the biggest issues is always how to carry a camera comfortably. And if I'm shooting an event or a race, that suddenly becomes two or more cameras with lenses attached. They're all heavy, and I don't want them swinging around and smashing into things. But they also have to be immediately accessible when I need them. Over the years I've tried various different camera straps from a wide range of manufacturers. I've used leather straps, neoprene straps, quick release straps, and even tried a few glide straps although I've never actually used one in the field. The two most important features of all my favorite straps are stretch and grip. When you're carrying a heavier camera over your shoulder with a rigid strap, the weight of it causes the strap to dig into your shoulder, and it bounces a tiny bit with every step. This may not be overly noticeable if you're just going out for a casual stroll with a small dSLR and lens, but if you're carrying a larger Pro dSLR with a lens like a 70-200mm f/2.8 or even a 300mm f/2.8, it becomes irritating quite quickly. Also if you're moving around a lot camera straps tend to want to slip off your shoulder, perhaps not an issue with a smaller camera if you're not in a hurry, but it can be disastrous if you're running somewhere with a bigger camera. A strap with a bit of stretch tends to make the camera feel less heavy, a subtle things perhaps, but it's noticeable when you shoot every day. In the past my favorite strap was an old LowePro neoprene strap, the only real issues I had with it were that it was almost too stretchy, and once attached it was a bit of work to remove it (sometimes I like to shoot without a strap) Even with the grippy rubber dots on the underside it would slip a bit as the camera bounced while I walked or ran, I'm not sure exactly why, but it seemed a bit like a rubber band. It was definitely comfortable, but not perfect. The CSLR Split Strap has become my new favorite camera strap. 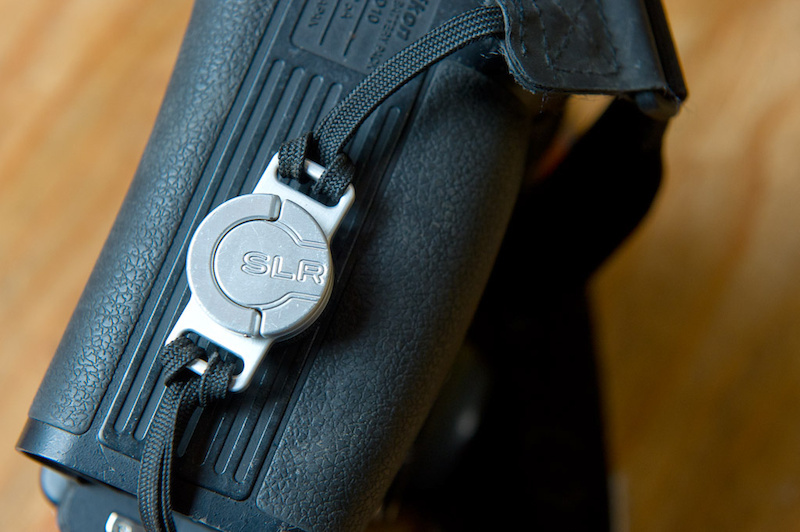 CSLR's C-Loop is a great addition to any camera strap. I'm really glad that the site is taking a positive look at photographers and reviewing gear using the whole "Pinkbike's take" thing. It's great for us photographers wanting to learn more and more on the gear in the industry. Keep it up guys! I'm always somebody that has used a strap and in doing so I have spent a lot of time and money on them, I currently have a neoprene camera strap, from Jessops in the UK. It's one of the cheapest straps I've had but yet it still seems to be comfortable and I get on well with it. If I spend a whole day shooting, for around 8 hours, I don't feel the strain that I once did with the original Canon camera strap that I used. I like the idea of the split strap and it looks a better design than the clip one that I currently have and I will look into purchasing it, because the design looks solid and it looks comfortable also. I had been looking for a new strap for the longest time, but hesitant to purchase. Then I met Ben from CSLR at AT's Showdown in 2010. He let me try out the C-Loop and I was impressed at how much time and effort went into it's creation. Many other designs are some version of an eye-bolt and a clip attached to a strap. I have been using my C-Loop since Sea Otter 2011 and the split strap shortly after that. In the world of cameras, it's difficult to find this kind of quality for a decent price. Well-made and well-thought products. It's cool to see Ben out using his product at bike events as well. Good on ya, Ben! No matter how innovative your C-loop (a tripod mounting point with strap loops) is, by pricing it at $40 USD, you automatically kick a large portion of your market out the window. $40 for a piece of metal with two moving parts (I think), is a bit much - especially considering that you have to buy the rest of the system. Unless you plan on only marketing it to professionals as a "overpriced but worth it...sorta" piece of gear. Are you saying that it is priced for professionals rather than for the actual worth of the product? I think that companies which start and follow that kind of principle are a little evil. "I think pro's will pay x dollars, that's all I care about". I mean, at the end of the day, you have many competitors offering their versions of the same thing for something like 10-20 dollars. When your product is priced like this, not only do you choose to exclude a section of the market, but you may not have made enough of an incentive for anyone using BlackRapid's to switch over. The biggest incentive that I see as a plus is that your strap + c-loop combo is only 60 dollars which is highly competitive. The C-loop by itself is not really priced so well, though. Lastly, is the c-loop tripod plate mountable? Ok, I'll reply again, but keep in mind that it's not my product. I'm simply replying as a professional that has used this product and happens to like it. I'm not saying that it's 'priced for professionals' I'm simply saying that for a useful product that is honestly a very cheap price if it works. It's custom CNC'd in reasonably small quantities, so I'm sure that price is not at all exaggerated, if it was a bike part it would probably be twice the price. I can remember buying CNC'd anodized brake bits over 10 years ago that had no moving parts and were $50 or more, so really I think the price is not an issue. As far as being tripod plate mountable, no, the c-loop is not compatible with a tripod plate, however it's very easy to remove with your fingers. If you want to have both check out the new M-plate camera QR plate they're working on, you can see the latest video of it here. It works with Manfrotto RC2 and Arca Swiss heads as well as the Really Right Stuff QR, and gives you a strap attachment similar to the c-loop. I shoot events and am usually on my feet and on the go for anywhere from 8 - 12 hours per job and I swear by the BlackRapid strap (RS-7). The ability to throw a tripod plate on and still use the strap is a huge advantage. My cameras feel way better when they're not swinging off my neck. I've been using this strap for about 6 months with the c-loop. I must say its super comfortable even when carrying my Gripped 7D and 70-200 2.8. also for those of you who use qr plates the are in the process of making them. I use a Spider pro Holster they come in single and double camera . Camera does not move when walking and I like it much better than my BlackRapid strap. yeah I saw those a while ago, haven't tried one yet. How are they with bigger lenses and while you're in a crowd of people? or running to get a shot? Those would be my biggest concerns. Let me know! Camera does not move . Weight is of large camera and lens is minimal compared to straps. You still need think about your camera at your side when moving in close quarters but way less than a strap since it does not swing out or move like straps. I am a fan of having a QR plate on my camera and no strap... but if it wasn't for that, looks kinda cool. Nice. I've been looking for something like that to easily carry my camera while hunting. I'm an idiot, should have kept reading about their Kickstarter project! there we go . . . i am lost in this thread, , but one thing i noticed, camera also got some pretty sick gadget! Blackrapid rs-5, hands down, Black rapid wrote the book on straps. I shoot stockcar racing during the summer with dual cameras, usually a 70-200 f/2.8 and a 18-28mm, some times a 400 f4 at the road tracks. the pocket is perfect for holding cf cards and my lenspen. It works great with the ds system, the rs-5 and rs-1. I saw these the other day somewhere, looks pretty nice! This look amazing but had you try blackrapid's strap Ian?